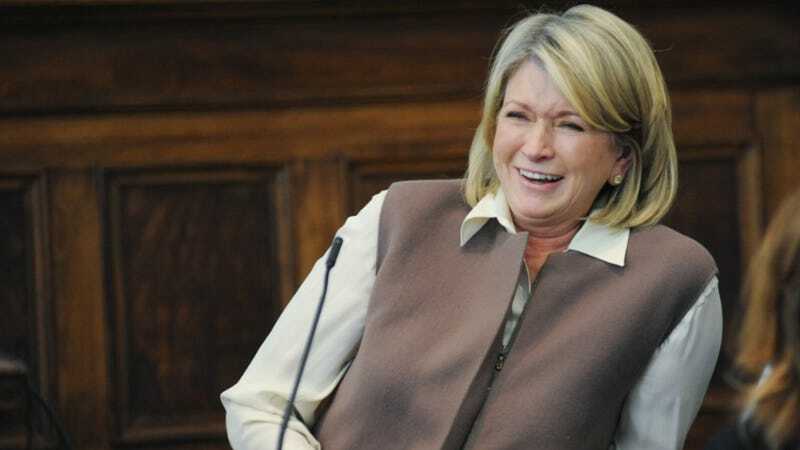 Martha Stewart: she's just like us! She attempts to fill out online dating profiles and then self-consciously shuts the whole operation down! The only difference is that Martha gets to sit outside of her mansion chatting with Matt Lauer about her abortive attempt to join Match.com, and everyone pretends to be really interested in what she has to say, whereas no one in the universe wants to listen to the rest of us talk about the forlorn state of our love lives. The French bulldog whose blurry ears are poking over the top of Martha's casual yet tasteful deckchair serves as a point of identification for the audience. Like the viewer, he is bored almost instantly and starts to inspect the foliage, only to perk up suddenly when Martha Stewart affirms that YES, she does love dating! Can you believe it? Matt Lauer cannot. As a person who likes to date, Martha was driven to "MATCH-dot-com! ", but couldn't bring herself to get very far on the application: "I started to laugh halfway down the page. It was, like, impossible." After perusing the Match.com application, my best guess is that she started cackling to herself upon seeing the question "What would you do with a surprise bonus?" and then went into one of her greenhouses to build a shrine to The Art Of Entertaining out of air plants. Denizens of Jezebel: what do you think belongs on Martha's dating profile?